Tattoo Suppliers are always looking for more ways to market their products, and for decades have sold their machines as animal markers. With a simple modification to the tube assembly where a fingertip switch replaces the foot switch, these machines could be sold to veterinarians, medical labs, and racehorse owners. It is necessary to modify the switch because tattooing is often performed in a barnyard and the foot switch would not work. The marking of animals goes back to 2,000 B.C. when the Egyptians marked their cattle to prevent theft. This marking identified ownership and was often part of early historical records. When Spanish explorers brought the first cattle to North America in the 16th century, cattle branding became widespread. Often these brands could be the owners' initials or the name of the ranch. In most cases a brand on an animal is considered proof of ownership. Cattle are not the only farm animals that are marked for identification. Back in the day when armies moved by horsepower, the military painted identification numbers on horse's hooves. The Archive is in possession of a 1910 news article stating that hoof marking lasts about four months, although in a plan molded after the British Army, ID numbers and letters were later tattooed on the horse's lips. For decades the Jockey Club Thoroughbred Breed Registry has required that all thoroughbred racehorses be identified using a tattoo. 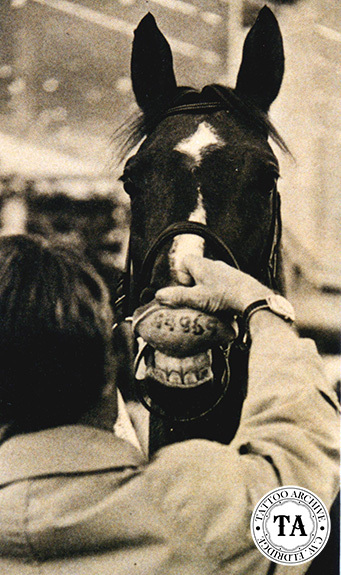 The tattoo is applied to the inside of the upper lip and encoded with numbers and letters which represent each horse and the year it was born. This method of identification has been so successful that the Jockey Club's website offers to trace a horse's history by using the lip tattoo code. Dogs, rats, turkeys, chinchillas, rabbits, foxes, fish, monkeys and alligators are but a few of the animals that have been tattooed for the sake of identification. Before the modern microchip came along, tattooing of dogs was very common and some breeds were even required to be tattooed. Dog owners had a registry for these numbers, much like the Jockey Club, and I have heard many a story of a family's beloved lost pet being returned because of these numbers. Besides marking animals for identification, some pet owners have taken it a more decorative level, tattooing their pets with attractive designs. 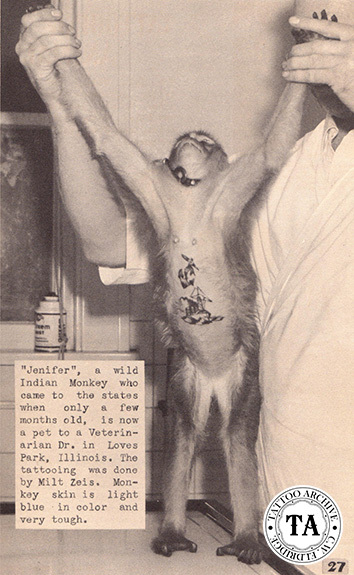 Lyle Tuttle's dog Chadwick had a heart with the word mother tattooed on his inner thigh and Milton Zeis, in the 1950s, tattooed the monkey Jenifer with an anchor and ship on it's stomach. 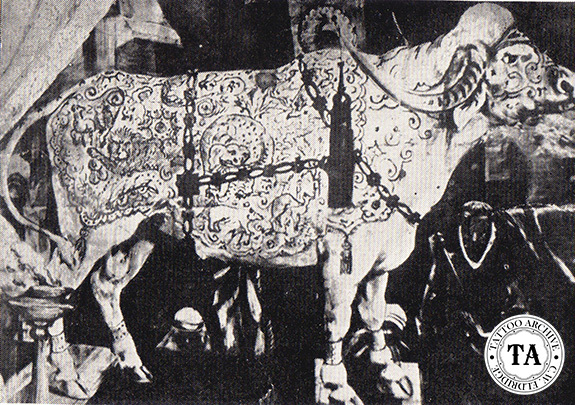 Frank Graf, a 1920s Coney Island tattooist, is said to have tattooed a cow which was displayed in the sideshow. And let's not forget the Tattooed Pig and Hairless Dog Project (1976-1984) created by Andy Feehan. Stanley Marsh III, a millionaire, artist, philanthropist, and prankster from Amarillo, Texas along with tattooist Randy Adams was involved in the hairless dog project. Marsh furnished the money and Adams the artist vision. These were great spectacles in the tattoo world but few measure up to the 1906 German pitch card that shows Miss Emmy and her tattooed dog. 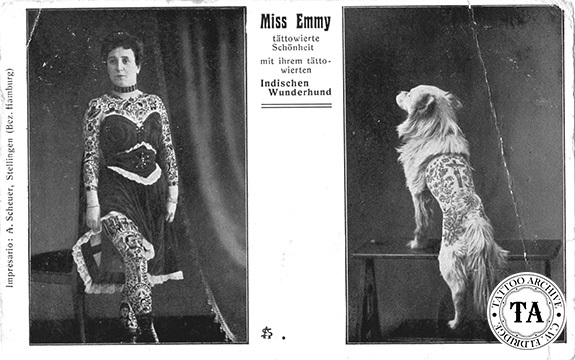 Miss Emmy, a famous German attraction, is seen in several postcards and pitch cards from this era. The dog is posed for the camera with its front legs on a small table and has been shaved so that its back piece is clearly visible.